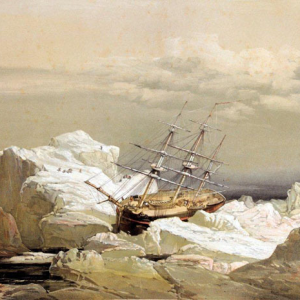 One of Sir John Franklin’s ships trapped in ice looking for the Northwest Passage. I was struck by this New York Times story on a luxury cruise ship sailing through the Northwest Passage. I couldn’t help but remember how so many lives have been lost looking for this shortcut between oceans. Probably the most https://johngradynowandthen.com/whales-tales-and-the-northwest-passage/famous doomed expedition was that of Sir John Franklin in the middle of the 19th century. One-hundred and twenty-nine men died in this venture. Searching for the party to rescue or find their remains provided a cover for the American Navy — through private funding to enter the race to be the first to “find a navigable sea route across the top of North America.” For decades, the Royal Navy considered these waters clogged with ice theirs alone. My “Whales Tales: Matthew Fontaine Maury and the American Quest for the Northwest Passage” appears in the autumn issue of Sea History, the National Maritime Historical Society’s quarterly. The piece is based upon a paper I delivered this spring at the North American Society for Oceanic History in Portland, Maine.